Regardless of the number of properties you own, whether a single unit occupied by noisy and problematic tenants or dozens of units across the state, a landlord’s job is extremely stressful. Property management is not an easy task at all and one has to resort to some tips and tricks to reduce stress. According to Stress Management Society, stress is a physical response of our body, when we are mentally tired or exhausted. Let’s firstly understand what happens during stress. When we are stressed, our body considers it a state of attack and launches the ‘fight or flight’ mode. This ensue the release of complex mixture of hormones and chemicals, such as adrenaline, cortisol and norepinephrine. This process basically prepares the body for physical action and generates a series of reactionary acts like blood is diverted to muscles or some unnecessary functions of our body are temporarily shut down like digestion. Although acute stress is natural process and is acceptable if it occurs occasionally. However, long-term, continual and chronic stress is unacceptable as it affects our whole self from physical to mental and emotional health. Moreover, it also affects personal and professional life adversely. 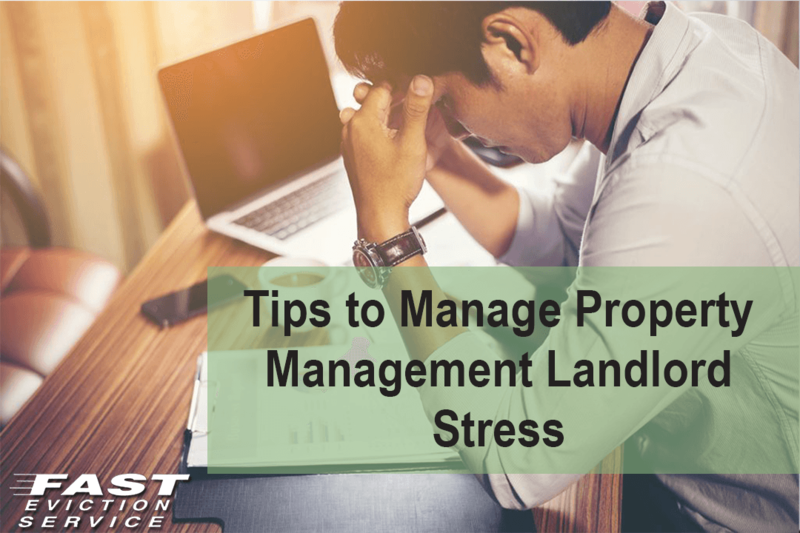 It is worth noting that landlords are constantly dealing with stressful situations and are in dire need of stress management tips that are productive as well as healthy. These four tips will help you overcome property management landlord stress and deal with tenants without overburdening yourself mentally and physically. We do know that stress can only prevented through remaining active and exercise is the best way to do that. Exercising diverts your focus from stress-generating issues and releases pain-killing endorphins into your bloodstream. You can opt to join a gym but we suggest that you register at a local rec league team because as a landlord you need to remain socially active and joining a league will enhance your social camaraderie. When you are watching the TV, try to tune into a channel that offers healthy entertainment and does not stresses out your mind anymore. News channels generally report about depressing and divisive news and seldom do we get to hear something that is good and uplifting. If you don’t want to become anxious while watching the TV then avoid news channels and spend time watching something that lightens up your mood. When we say spend quality time, we don’t mean that you need to gather everyone in the lounge and collectively watch TV or have dinner. The idea is to do something that helps you deal with work-related stress. Try to participate in activities that are entertaining for the whole family; a night out at nearby amusement park, a picnic by the beach or simply playing board games. It is a widely accepted fact that when we are stressed, we eat a lot and unhealthy food becomes our top choice because we believe it is a coping mechanism. Always remember that the food we eat actually aggravate the symptoms of stress. However, being selective in choice of foods you can prevent or treat stress. Foods such as nuts like cashews, fruits like avocados and berries, veggies like asparagus or even chocolate are all bursting with stress-relieving properties. So, you can fight stress in a healthy way through food as well. Being a landlord is stressful but there are plenty of benefits and perks as well associated with this job. Everything from rent collection to finding new tenants or dealing with difficult tenants can create landlord stress. So, with these four tips, you will be doing yourself a favor by managing the unavoidable rental property management stress healthily. Is It Time For You To Hire A Property Management Company?